Today I was sorting through a plethora of cards in an old forgotten box. The reason I dove into the box this evening was to remind myself of what exactly do I have lying around the house. As a kid, I used to draw on my card boxes or smack stickers to them. Ol’ Skool’ Hip hop stickers that were largely given out at various concerts for Emcees who never made it into the big show. What I found inside left me thinking “why the hell do I have this stuff”! It was littered with rookie cards of unknown players from the MLB. There is more of a back story to some of these mini boxes. Way back in the early 2000’s, I caught the bug to start collecting cards again. I had left university in 1998 and spent the next few years caught in a world wind of dead end jobs. There was a flea market just down the road that I used to visit every Saturday morning. At this very flea market I happened to run into a fellow who I thought was a decent person. I was young and naive and I didn’t know any better to trust my gut instinct and not get trapped into a bad situation. This person used to sell me lots of baseball rookies that would hopefully one day make it in the big leagues. What I didn’t know was that I was sitting on horse manure instead of something worth prospecting. A lot of these players had already stopped playing well before he sold me the cards. It wasn’t until I had gotten more experience in the industry that I realized the error of my ways. This particular fellow took me for a lot of money and I shelved these cards away hoping that maybe one day I may be able to recoup my cost. Well that was 10 years ago and today I forced myself to look through the cards. Most would get upset and blame society but I refuse to do that. This was my fault. Today I was determined to find a silver lining somewhere amongst these cards. I got an idea! I want to start blogging about the best names that have appeared on cards. At the very least, this made me smile. Today’s player is Wes Swackhammer! What a cool name to have as a baseball prospect. So without further adieu, here he is! 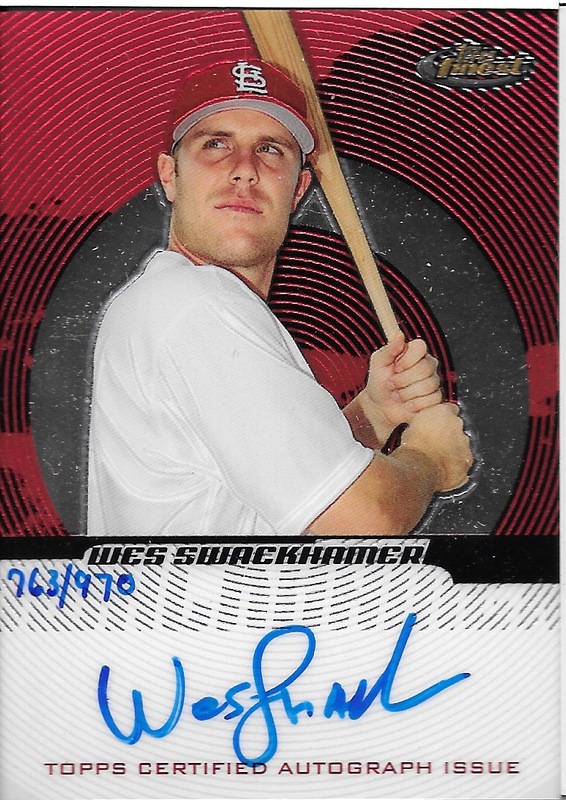 Tags: a new blog idea!, MLB, Rc Rookies, the silver lining, Wes Swackhammer. What an awesome name!